Need a Reminder Of The True Meaning of Christmas? Look No Further Than These Kids — Lodi Live! Mason didn’t know a lot about Maddie, but he knew she loved Christmas. “My husband’s aunt is a teacher at Reese,” said Bobbie. “The same school that the kids both go to. She got us in touch with Mrs. Hall who was doing other fundraisers for Maddie to see what they needed. I figured she was already going to be getting toys and stuff from her family, so Mrs. Hall got in touch with Maddie’s mom to see what we could do. She said Maddie really wanted the house decorated but with going back and forth to San Francisco (because that’s where she’s doing the treatment) that they just couldn’t do it. So Mason picked out all of the lights and decorations and we went over there on a Friday after school while she was at her dad’s. Then when she came home on Saturday this (the house) was all done.” Mason picked out the lights and the decorations and then he and his family decorated. He personally got to set up the unicorn and angel, with the assistance of his Papa. 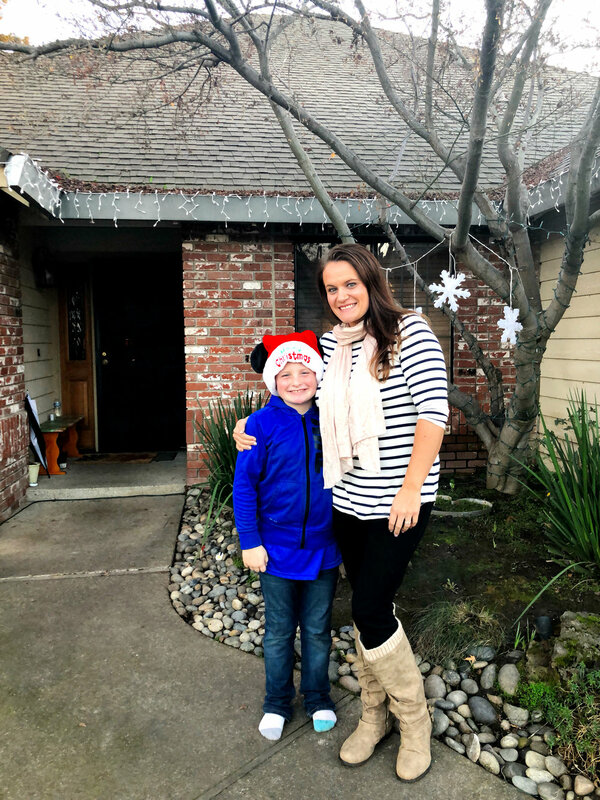 Besides the Christmas lights, Maddie’s family has something even more special to be grateful for, and that is to share that Maddie is now cancer free. She still has six more rounds of treatment, but the cancer is gone. I love to think that for the rest of their lives, every time Maddie or Mason, or their families, put up their Christmas lights, those lights can serve as a reminder of Mason’s loving act, and the family’s gratefulness that Maddie is now cancer free. “What is your favorite part of Christmas?” I asked Mason. “It’s baby Jesus’ birthday and we get to enjoy it with our family.” That’s right folks: plain and simple. The best way to celebrate Christmas is by sharing our love with others and being grateful for everything we have. Who better to remind us than these two, sweet kids.